Hierarchical: In this kind of org chart, each individual division is subordinated to the top entity. Matrix: The format normally has more than one reporting line, which can be shown in a series of cross lines. 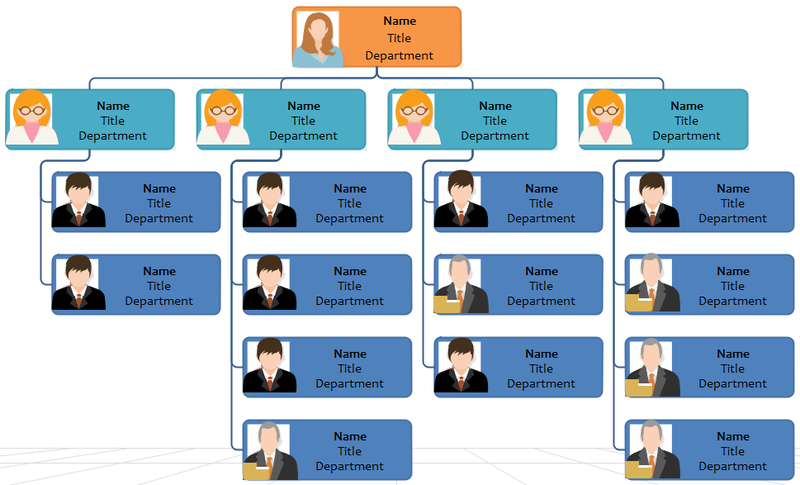 Flat: The type is also called as the horizontal org chart, where only limited levels of management roles are involved. Here is a template for the hierarchical type org chart. You can clearly see the top position in orange leads the overall team or department. The four green ones are sub-leaders. In reality, it is the most common case for companies. 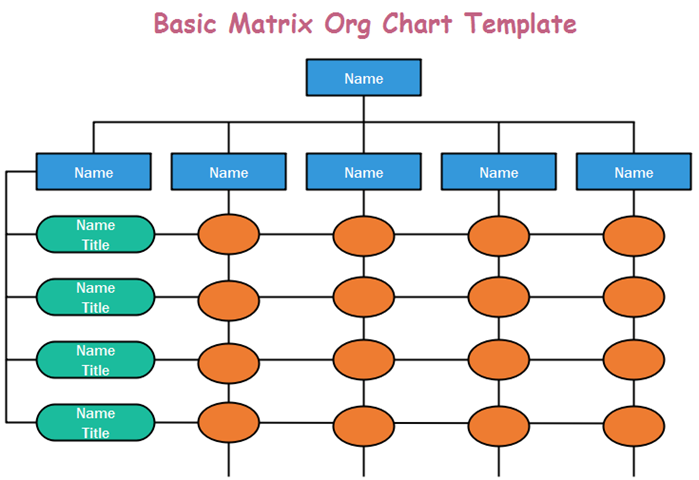 This one shows an option of the Matrix org chart templates. All of the straight lines are crossed. This diagram presents a flat type company org chart. The person in the center position is usually the CEO of the whole team. In theory, the longer the distance between your position to the CEO, the lower the management level you have. How about Practical Company Org Chart Categories? Startups org chart/Small Business: This refers to newly established firms within usually no more than 50 team members. In such types, each of the positions may have multi-duties. For example, the Admin Leader in a startup may need to handle both human resources and admin tasks. Middle-scale Firms: This category seems to account for a considerable amount of the overall firm numbers. Compared to small business, middle ones have more clear functional departments but contain less specific roles than large scale firms. Large Scale Enterprises: You may have already heard about many big names from the category. 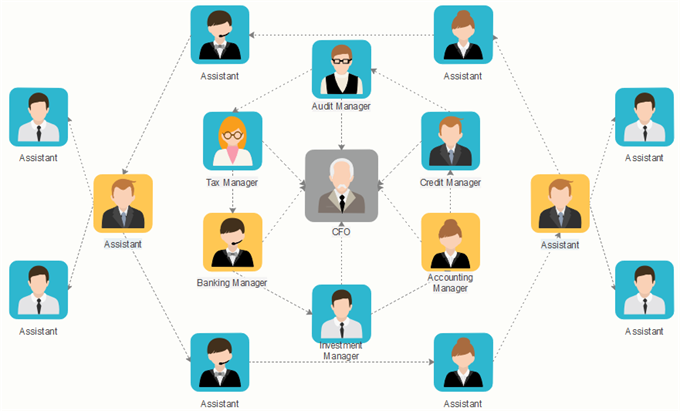 Large business organizations have complex company org chart structures. 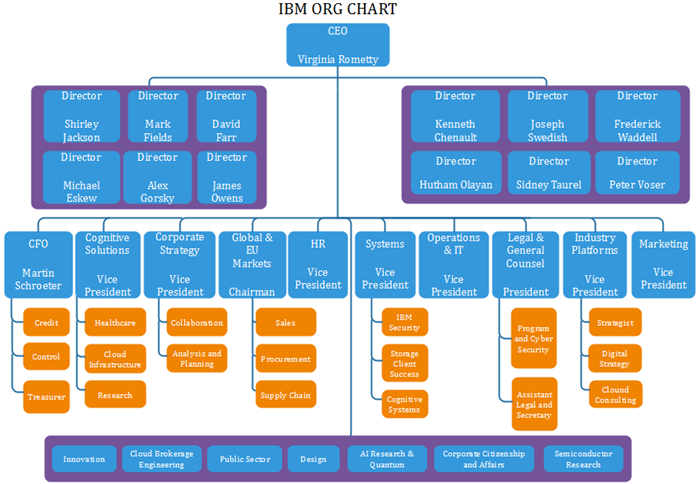 This image shows the IBM org chart. It belongs to the hierarchical type of organizational framework on a quite large scale. 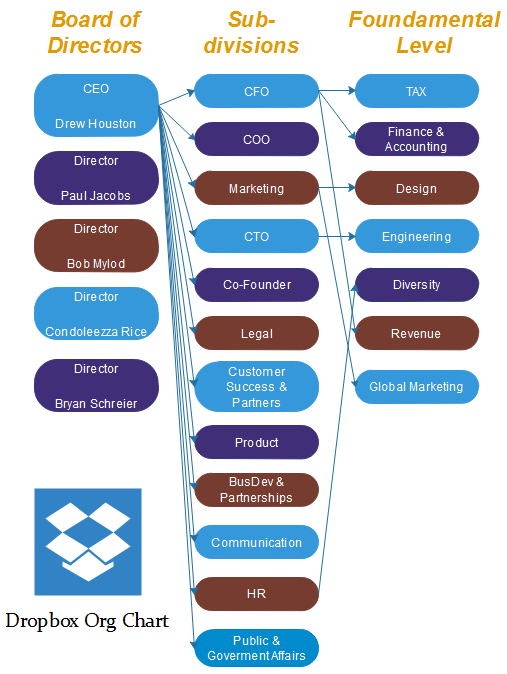 This image shows the Dropbox business org chart. It also shows the hierarchical kind but in a bit different style. 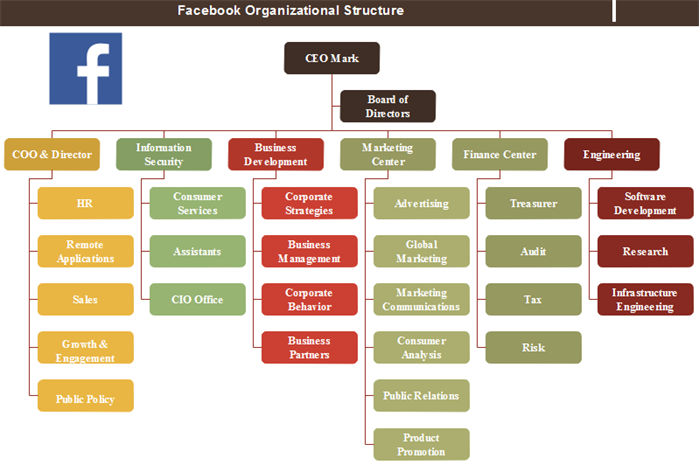 Here comes the Facebook Organizational Structure. Like IBM and Dropbox, you can see the Board of Directors in the diagram. How to Create My Company Org Chart? The overall process is easy even for diagram design beginners. Simple have a check for the guide Org chart creator. Alternatively, feel free to try this easy org chart creator for more advanced settings and management of your business teams.